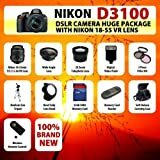 #5: The Nikon D3100 SLR Digital Camera with Nikon 18-55m f3.5-5.6G VR Lens HUGE PACKAGE including 32GB SDHC Memory Card + Card Reader + Wide Angle Lens + 2x Telephoto Lens + Filter Kit + Digital Flash + Case + Tripod + Lens Hood and MORE! Digital Inspiration. That's how the good folks at Canon define their EOS 60D DSLR Camera. With an 18MP APS-C CMOS sensor, a 3" Clear View LCD, and HD video capture, among other mouth-watering features, perhaps you will agree. Let's take a tantalizing tour of this highly-anticipated DSLR camera body. 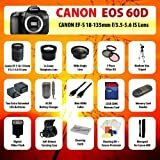 #7: Canon EOS 60D Body SLR Digital Camera + Canon EF-S 18-135mm f/3.5-5.6 IS Lens + 2x telephoto Lens + Wide Angle Lens + Filter Kit + 2 Extended Life Batteries + Charger + 32 GB CompactFlash Card + Flash + Case + Tripod + MORE!